Xue Yiwei is a writer between continents. 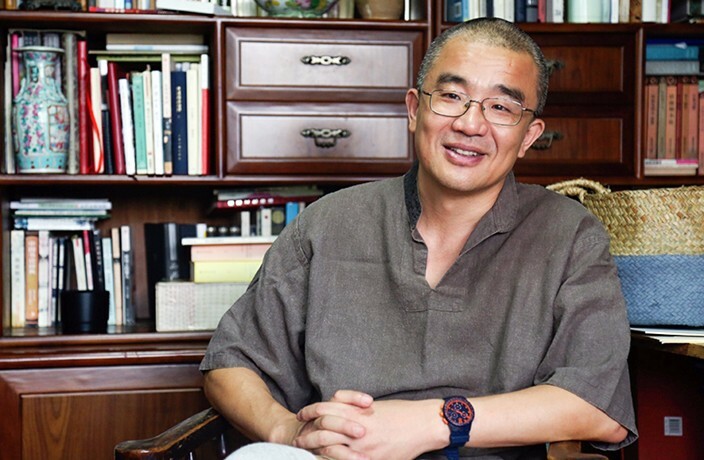 Described as “a maverick in contemporary Chinese literature” by Ha Jin, winner of the National Book Award, most of Xue’s work has been written from his adopted home of Montreal, Canada. Originally from China’s Hunan province, Xue’s recently translated collection of short stories, Shenzheners, was inspired by (and dedicated to) James Joyce’s Dubliners. The characters in the book hardly mention Shenzhen at all. What makes them Shenzheners? All the characters have prototypes – people who I’ve really met. I feel their feelings, and I feel their sense in the city, the youngest city in China. For example, ‘The Peddler.’ I first met the Peddler 33 years ago in another city. But I saw him again in Shenzhen. He may not have been exactly the same person, but it was seeing him in Shenzhen that really helped me to understand him. Do you see yourself represented in any of the stories’ characters? Yes. In ‘The Peddler,’ I am the prototype of the teenage narrator. The violent scene that takes place near the entrance of the school is something I really saw when I was 12 years old. The narrator of ‘The Prodigy’ bears some resemblance to me, too. I used to be considered a prodigious boy and this upset me. People often describe new Chinese cities like Shenzhen as not being the ‘real’ China found in the countryside. Do you think your story collection is fair reflection of what’s happening in the country today? All parts of China are the ‘real China,’ not just the rural areas. Shenzhen is a city of immigrants, like Beijing, like Montreal. But I see them as part of a full picture of China – I know their roots, their stories, their pasts. They all have a connection with the ‘real’ China. That’s why my stories focus on people. If you only focus on stories of power or money, these ‘real’ stories will be lost. So your book is a collection of immigrant stories? Yes, almost every [character] is an immigrant. For so long in China, everyone just stayed in the same place, so it’s amazing to have these different perspectives in Shenzhen, all from the Chinese context. But it’s also got the international perspective. For example, in ‘The Prodigy,’ the Prodigy plays the piano, which links him with Western culture. In every story, foreign books play an important role. Each story is connected with the outside world. A lot of the stories in the collection deal with thwarted romance. Do you think it’s harder for people to form connections when everyone is a migrant? In a city where everyone is an outsider, any sense of belonging is limited. People’s detachment from each other is always an image, or rather a shadow, of people’s detachment from their place. You live in Canada but are more popular in your home country. And your work is so specific to China. Does living abroad give you a better perspective on China? Yes, I think so, because China and Shenzhen keep on changing. Some people have suggested that I write another collection about Shenzhen today, but I think it’s better to focus on my memories from the outside. So if not another book about Shenzhen, what’s next for you? I don’t really know what my next novel will be. I’m considering writing something about Ganxiao, a place built during the Cultural Revolution to reform the Communist officers and leading intellectuals. My father was sent there in the early seventies, and I used to spend some time with him there. It was a profound experience. But in the past three years, there has always been something unexpected jumping in [to my work], and I have never found the time to write what I plan to write. Shenzheners is published by Linda Leith Publishing and is available through Amazon and at The Bookworm. Zhang Lijia's Lotus shines through the dark. Looking for a good book to read this summer? We've got you covered.